I am so thankful that Scotty and his friends are alright! Such a frightening experience! 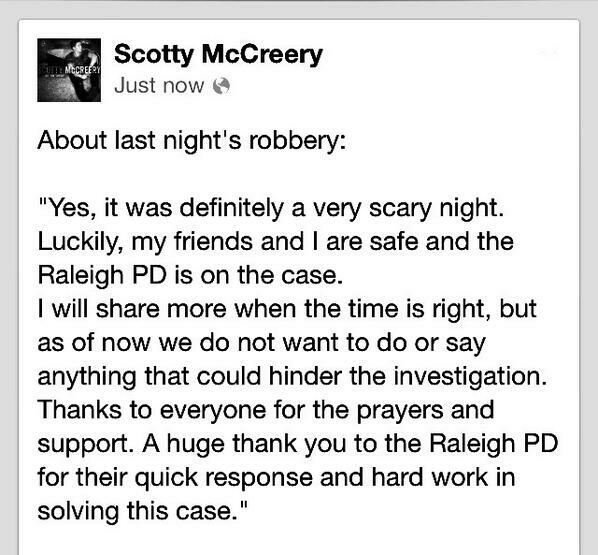 I just wish there were not so many people who know where Scotty lives and have published that info in various places. Now that he is famous he and his family need to be very careful to maintain their privacy and safety. I know he wants to live as normal a life as possible but he needs to be very cautious. The news reports say that this happened while he was at a friends apartment. I wonder if he could have been followed. It seems strange that they would randomly pick an apartment where he and a group of friend were at. Such a terrible thing to have happen. My thoughts and prayers go out to him and his friends. I hope they catch those responsible.